So I've just only recently started watching Suits on Netflix. Yes, yes I know I'm a bit late to the party, especially since having worked in Advertising you'd think I'd have the box set. While being a spectator to the infamous Harvey Specter swanning around saving the day, every-single-time (poor Louis), and doing it all while looking so suave, it got me thinking about the challenge us guys often face when it comes to what's office appropriate and how to keep yourself looking good, on high rotation. 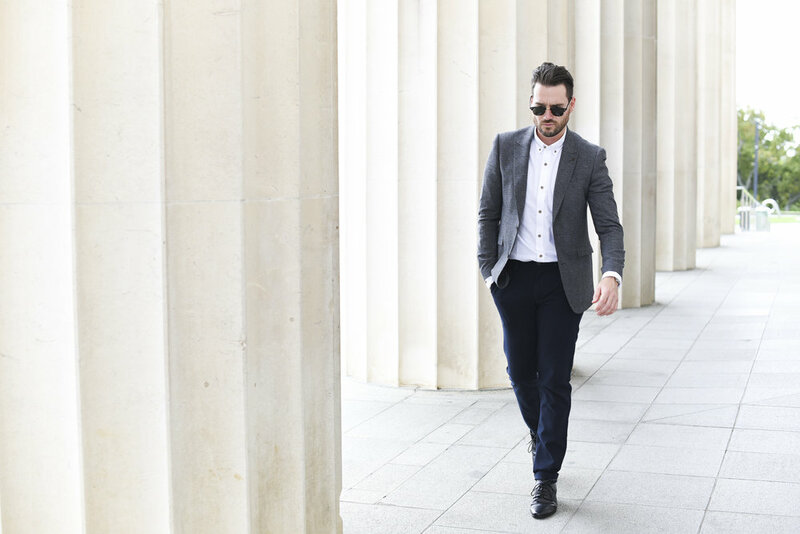 For those who work in the corporate world or shared office space, it does demand a level of professionalism and sophistication, and your wardrobe choice is not exempt. But with 5 days a week, it can get quite difficult to not wear the same one or two outfits. While we all can't be Harvey Specter, we can find inspiration in how he exerts his personality, confidence and charm through his sense of style. On the subject of style, I've partnered with one of the original style tastemakers Barkers. 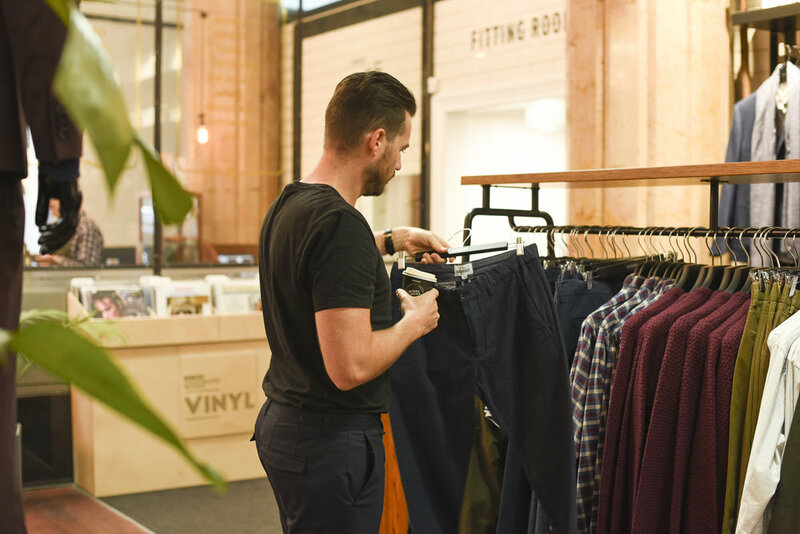 Barkers been a part of my life and my subsequent style evolution since my early twenties, so it felt rather fitting to work with the team at Barkers and get friendly with their new season threads to help demonstrate how you can be the Harvey in your workplace. This classic three-piece suit pays full homage to the hot shot lawyer Harvey and I think your work compadres will appreciate the statement. It's got everything you could ever ask for in a suit; it's sharp, sophisticated and made from 100% Wool. 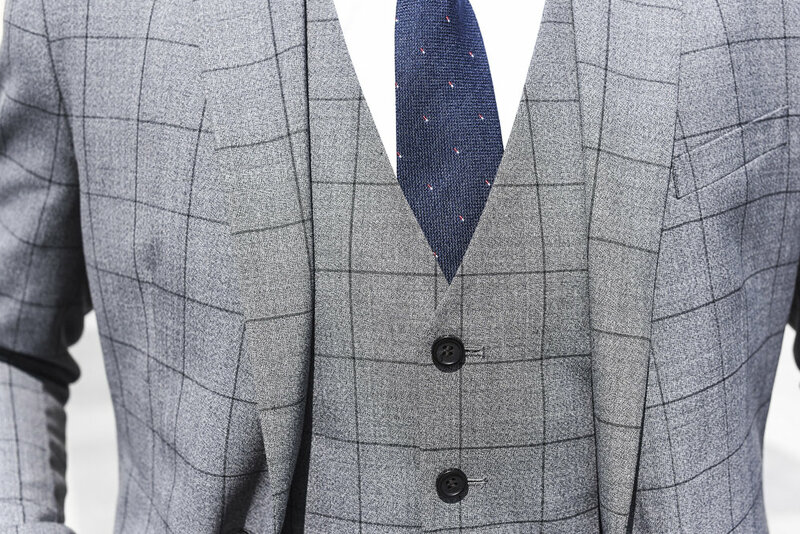 The Calcott Check Suit is light grey in tone, with check detailing to round out a bold look for the modern man. If you have any reservations about a three-piece, you can rest easy, as the waistcoat is making a comeback this season. And to be honest adding a three-piece to your suiting line up will stand out and stand the test of time. No suit is complete without a timepiece. I tend to be personally attracted to simple yet elegant watch faces and came across this Porter Leather Nixon watch which looks like it was made for this outfit. Nice brown leather straps that match the shoe leatherwear (my own Calvin Klein shoes but you can grab similar here from Barkers) and a white watch face that mirrors the cleanliness of the poplin shirt. This level of detailing doesn't just happen by mistake either guys, it's properly thought out, and that's how it should be if you want to really set the style standards high at work. Socks are an important addition to your outfit too. While these socks are my very own Batman favourites, Barkers stock a variety of fun looking socks. Don't be afraid of colour or patterns either, you're totally allowed to have fun when it comes to socks. It's also a fact that people who wear funky socks are smart, rebellious and successful. How 'bout dat. While packing up this swish new suit, Dave - the High Street Store Manager, prepped my tie with a single windsor knot, knowing that shooting multiple outfits would be hectic enough. Legend. 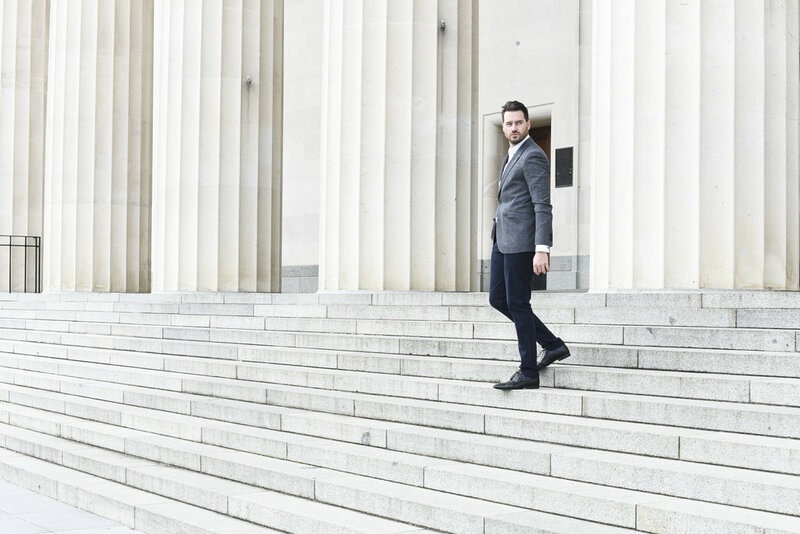 Barkers know how important a good fitting suit is to a man and they'll be there the whole way with you. 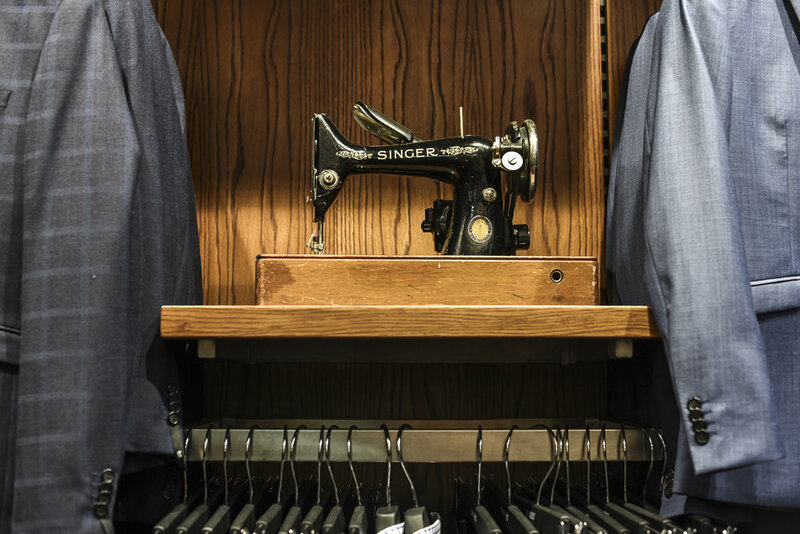 The tailor will measure you up, get you in the right size pant & jacket, and pin up any adjustments that might be needed to make sure the suit fits like a glove. If you ever wanted your middle named to be replaced with Dapper, I suggest you jump into a three-piece suit before your next big meeting. It'll be well worth the investment. This Kendrick Blazer was one of the first things I spotted when I walked into Barkers. And being grey it offered up a lot of flexibility which you need for workplace attire you're going to get a load of wear out. It's a 70% wool, 30% polyester blend so its got quality and it's perfect for the transitional period. I am a big fan of white shirts, and I believe it's a good idea to have a few variations. I knew this Thatcher Oxford Shirt with button-down lapels and contrast buttoning would give some welcoming detailing to the blazer and pants. It's a shirt you could simply wear in the office and out, I really liked it. Then there's the pant. Because I went with a light grey on top, a good rule of thumb is to go darker on the opposite. So with that in mind I located these dark navy Winsland Angle pants that worked well in association with the blazer. Light on top, dark on the bottom. The blazer, shirt and smart pant combo will no doubt become routine for your work wear line up. It's an easy look to keep fresh by simply switching out shirts and pants. The blazer can become the consistent statement piece so you're not always having to change out all three elements, but of course you totally can. Something that Barkers do extremely well is they know how to make life easier for us gents. We love burger combos, so why wouldn't we with fashion? You can grab yourself a nice new blazer + shirt + pant, all for $375. With the blazer itself costing $300 you're onto a winner here. One of the biggest trends this season is the arrival of suede jacket and I've been dying to get wearing one. So when I saw this Sharma Leather Jacket in-store it was going to be the starting canvas for the rest of the final more smart-casual office appropriate look. The Sharma jacket also comes in this more vibrant camel colour which I nearly grabbed to shoot, but stuck with the Navy. But seriously - either is a good choice. Continuing on with my white shirt theme, this look uses the same Thatcher Oxford Shirt from look two you can get some good mileage out of it. White against the navy suede really helps the jacket pop. With the weather starting to cool down, you'll be requiring some knitwear, and the Blackheath Crew jumper is a great addition to your line up. Simply throw it on under the jacket and it works a treat. The 'duckegg' colour is just awesome too, not a colourway you come across often. Onto the bottoms now. Applying the same aforementioned rule of thumb, since I've gone darker with the navy jacket, I'm going with a grey pant which is a popular tone this season. This Kendrick Pant helps elevate your whole look by adding some smarts to it, and as you can see I've paired the pant with some simple, yet stylish leather sneakers which you can find similar here. Funny story on these sneakers actually...between shooting looks, these shoes got nicked! Sneakers worth stealing I suppose! Again, Barkers are making it easy to get kitted out. You can pick up a warm merino knit + shirt or pant for $190. That's a good deal to be on your way to building your Winter wardrobe. Nice quote from Harvey. And it's true. The best thing you can do is be you, so head into Barkers to get equipped this season and have a good time discovering what style you want to rock in the office. And don't be afraid to be bold and try something new, you may just end up loving it.